Buying a car can be overwhelming. However, if prepared, the process can be relatively smooth and prevent remorse. These tips for car shopping can help take out some of the pain from the process. If you are going to be buying with cash, you already know how much you need along with taxes and registration. If financing, know what you can afford. Be realistic. Don't forget that along with monthly payments, you have to have full coverage insurance and your annual registration (depending on where you live). By staying realistic, you'll prevent getting in over your head. Will you be trading in an old car? Will you be getting a fair offer? If used, take advantage of the rebates. If going used, make sure you access records- previous accidents, how many miles, is there still a warranty? When I bought my Hyundai used, it had very low miles and still covered under the warranty until 60,000 miles vs the famous 10 years, 10,000 miles warranty. Also, research the market price on the car. Whether used or new- get that price lowered! I was able to knock $1800 off my car and get the dealership to include umbrella coverage on my insurance. Resources like Cars.com are great for researching cars that you are interested in. If you're looking for safety, reliability, etc.- research the car and their reviews. 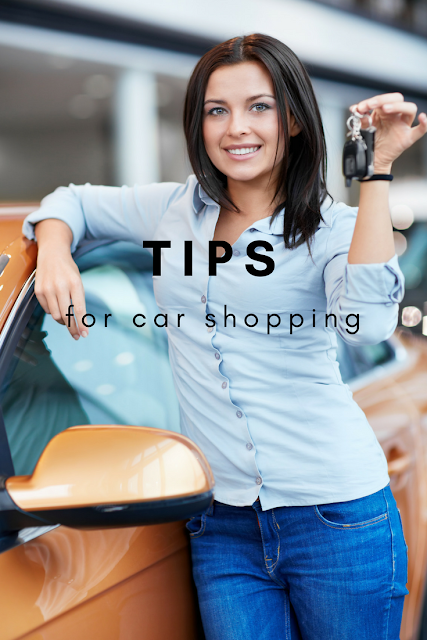 What other tips do you have for car shopping? Do you typically buy new or used? Do you buy cash or finance?